Sega has released the North American box art for its upcoming Wii mini-game collection Let's Tap. What does it tell us? Pretty much everything we need to know about Let's Tap! Beautiful, professionally modeled hands clearly explain to the potential Wii owner "You will play this game by tapping a box with a Wii Remote (in safety jacket, natch) resting on top. No, seriously." The box art is also careful to mention the "party experience." Clearly, third party publishers are learning the value of putting the word "party" on the box, even if no actual parties result from playing. 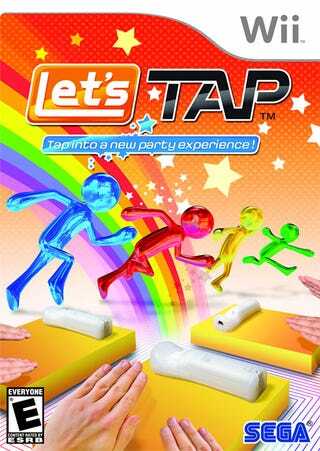 Finally, in order to stand out on store shelves, Sega has used every color in the rainbow on the Let's Tap cover. It also included an actual rainbow, just to be on the safe side. Clearly, PhotoShop has been put to its paces to make sure the Wii game can be seen from space. Overall, I'd call it a great, psychedelic freak out of a success. Thanks to Ryan for the heads up!